Titanium hair straightening flat irons are always the best choices for most stubborn hair or hair with thicker texture. Whether your hair is thick, very difficult to manage or extremely curly, they work impressively just by a single pass, so do they for African American hair and other ethnic hair. For natural hair, they’ll save you a lot of time for straightening. The Titanium flat irons are also lightweight, and you’ll feel comfortable to hold them over long styling sessions. Beside other application such as in watches, glasses, titainum is a hair-friendly material. Human hair benefits a lot from its properties as styling tool. When shopping for a titanium flat iron you could see the term Titanium often appearing together with other terms like nano, ionic. Nano means very small particles, and nano materials have perfect surface for smoothing out your hair, added ionic means your hair will be received more negative ions for repairing damaged sites on hair cuticles. The Titanium material itself is a metal that conducts heat most efficiently, while it maintain stable temperature all over its surface. Once the you pass the titanium through your hair, it compensates heat fast, making sure all parts of your hair sections receive equally heating. 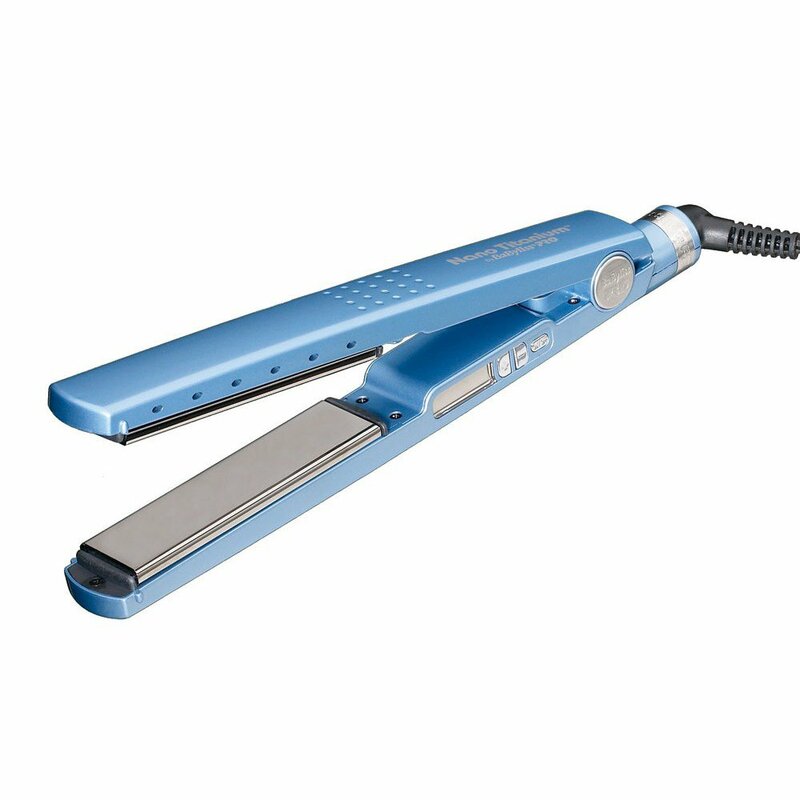 The Titanium plates are durable, and high quality hair straighteners have titanium plates with scratch resistance and free friction. Titanium plate flat irons also have more intense heat than ceramic flat iron. Perhaps, what makes The Babyliss Nano differentiate from others in particular is their plates and heating mechanism. Conduct heat through ceramic, to the outermost part, the titanium plates, which is smooth and has least temperature variation. Available in three different sizes: 1/2″ (mini), 1 1/4″ and 1 1/2″ the BaBylissPRO Nano Titanium , a time saving tool, offers every thing you need from straightening quickly to fast heating up. You can choose the size based on your hair length and textures. Check out this guide. They are varied in temperature, and the highest they can get is 450F. Your hand definitely doesn’t feel hot at all while handling these tools since the stay-cool Ryton housings are able to resist highest heat released from the plates. Heat up fast whenever you want to adjust the setting. The multiple settings allow you to choose the ideal heat for your hair. The BaBylissPRO Nano Titanium is great for frizzy, thick, long hair. It is easy to use, which you don’t have to have a light grip for hair. BabylissPRO continues to bring it’s values and good customer supports for users. This hair straighteners remains as my most favorite tools. This hair tool offers everything you need for perfect hair style, adjustable temperature, digital temperature display so you can monitor the right heat for your hair easily. Plus, it has a large plate size which is made of high quality titanium. The Ktx450 is a well-known and high-quality hair tool among hair stylists. It would be increasingly popular for home use as well. Keeping your hair healthy by not using heat styling tools frequently is a nice approach, and the KTX450 is one of tools, which is able to leave their profound effect on your hair to keep your straight hair style last longer. Design: Izunami Ktx450 is one of the best value flat iron. It is well-crafted with high quality plates, making each time you slide down effortless. Each turn of clamp is fluent by Swivel Cord. The KTX450 has large plate sizes, 1 1/4 inch, so it doesn’t take long for styling your hair, your hair is entirely straight within minutes. No more pinching or pulling your hair, with extremely smooth floating plates. Efficiency: For all kinds of titanium hair straighteners, you should use heat protection spray and change the heat setting step-wise to find the optimum temperature. The KTX450 can be used for keratin treatment, the permanent hair treatment, which keeps your hair style last for months. Heat recovery is fast to make sure your hair straightened in the same manner. Temperature settings: Dial heat setting varied in a range of 250°-450°F allows it workable on most hair types.